Joomla e-commerce / shop / catalog / directory extension with unique features! Powerful directory and e-commerce solution for Joomla! The solution can be used as a directory/catalog or shopping cart. You can use 3 types of products: tengible, virtual (downloadable) and subscriptions. Brilliantly fills a gap in the available extensions. Perfect choice if you need product catalog and/or e-commerce features (you decide). DJ-Catalog2 is really simple to setup and provides neat, modern responsive output without need of advanced configuration. It also integrates seamlessly with the site's template and design and has multilangual and RTL support. Presentation is a key. Most of the clients buy with their eyes. Create beautiful product cards, insert attractive images, add videos, tables, presentations and galleries. According to the law in force in case of specific products, in some countries, there is a need to settle the vat rate from the buyer country. Our system allows you to configure it. In the panel, customer has access to his invoices as well as purchases history. Discounts for store visitors are essential tools in improving the sale. With our system, you can generate any coupon codes (i.e. for regular customers or on special occasions) which will be deducted from the purchase price if used. The more information in your new store the more significant chance it will be found by the potential customer. Add files for download like catalogs or manuals as an addition to a costly product description. Highlight some of the products with special labels. It will bring the visitors attention to special promotions or occasions. It's an end of the trouble with invoices. With our store, you will be able to download them from the back easily-end panel and deliver it to your accountant. Encourage your clients to purchase more at one time thanks to adjustable price levels that depends on how many pieces of the same product will be purchased. The more, the lower price per item. This is a well-known and straightforward from ages method of increasing the seller income. A good product is just a half-way to success. The first impression is what may decide whether a visitor will dive deeper into your website. This is why your store needs to have a nice and clean but at the same time eye-catching graphic and layout. Make your offer even more attractive by adding additional service to your product that users may buy. For example a gift pack service. When there are a lot of products in the store, prices and stock levels updates may be a real nightmare. Our component provides an intuitive single-list view where you can change these amounts without going into each single product view. Be legal! Since May 25, 2018, in EU specific regulations regarding personal data protection applications. Not everyone is aware of severe penalties for non-compliance. Our store meets the new rules. Not every customer wants to set an account on your website. We give you a possibility to configure your store to allow such clients to purchase without the need of registration. Our store system allows you to add new menu items quickly and point them to new content or to existing elements to improve the navigation. If you sell your products to different EU countries, it is essential to validate the EU VAT number. You do not have to do it manually, our store will do it for you connecting with the online VIES database. We respect it, and this is why we developed our cart system to provide fast and smooth orders process. Remember, the customer needs to have a choice. Let the user decide if he likes to pay with credit card, online transfer or upon the pickup. Let him choose cheaper post or faster courier delivery. Group products in categories, it will make it easier for the client to find the right product and boost a sale. In our online store, it is easy to add your own custom landing pages like promotions description, policies, contacts, etc. 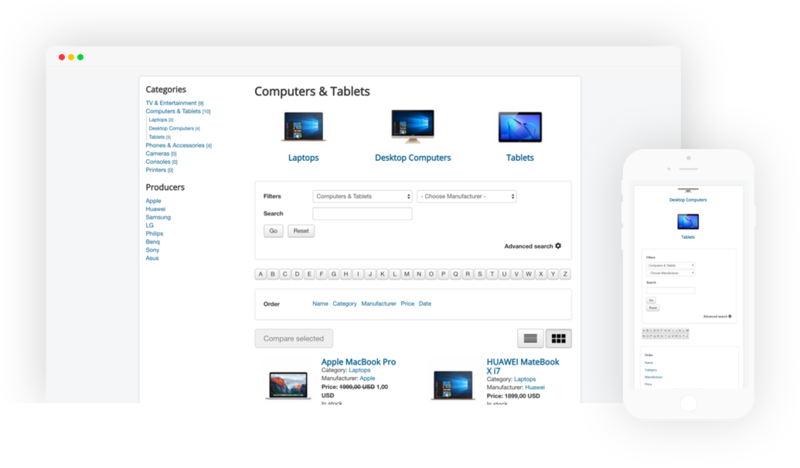 Your store will work great on desktops as well as on mobile devices. Make the search in your store even easier. Replace standard search with an intelligent solution which allows finding the desired product in a flash. Use custom fields as search filters. Your clients will be able to find the product faster which will boost your sale. Make it easier for your clients to choose the right product for them. The built-in product comparison tool lets the user set together few products to check their features. DJ-Catalog2 comes as a dual-functional solution for your website. Use it as a website directory/catalog or e-commerce functionality. Every part of the output can be hidden or displayed. With the two possible scenarios of the cart, you can use it as a query cart (so users can ask questions about the products) or as a product cart where users can purchase the items. It's up to you how you will use DJ-Catalog2. What's best is that you can change your mind anytime and start or stop using specific functions. The physical product, downloadable or subscription? Choose what product you want to sell. That can be physical goods, virtual products (downloadable) or subscription. Tangible products have the delivery methods available. Virtual products can be downloaded after the purchase. Subscription type products allow you to sell time-limited access to Joomla! user group. DJ-Catalog2 offers a Joomla shopping cart. Now it’s a feature-rich solution, easy to use, allowing to create an online store and start selling you products using all features required for a professional e-commerce website. With DJ-Catalog2 you can build great, fully featured directory in your Joomla site easily. Add, update, remove listings easily with Joomla UI in backend and clean frontend. DJ-Catalog2 was built with admins and users in mind. 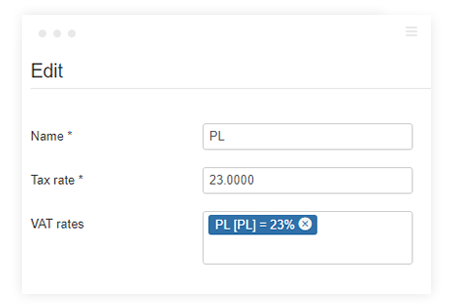 This feature gives the possibility to define VAT rate for a product, and assign different VAT rates to different countries. You can even assign a defined VAT rate for each product in your store. If the customer comes from a specific country, he will see a product’s rate given to this country. 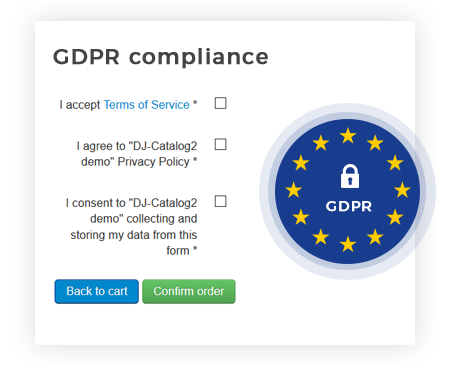 DJ-Catalog2 comes with a GDPR (General Data Protection Regulation) compliance. The “Ask about this product form” and “Cart form (Query or Checkout)” contain additional form controls purposed to collect personal data. All submitted forms will be sent via email (notification). Each email can be used as the proof. Learn more about the GDPR in DJ-Catalog2. Help your customers to make a decision. 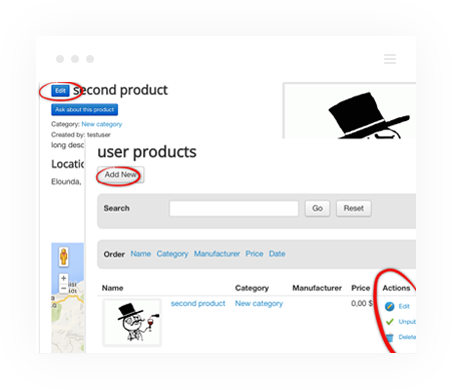 Use this feature to support users when they are considering the attributes of products. The comparison is a popular activity that users perform on the web. In many cases, it’s required action before site’s visitors will perform the desired action. The extension comes with many deeply configurable modules out of the box! Administrator can allow users to add/manage the listings from frontend. Many additional settings available (email confirmations, images settings, attachements etc). You can set the output of the DJ-Catalog2 in many ways. 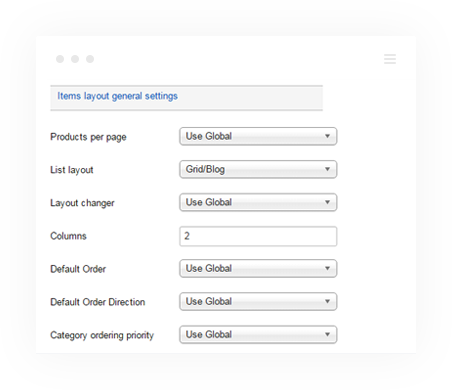 Also assign different outputs to categories, menu items and even single product. The new feature is also possibility to allow users to choose the layout style of the listing - there's now a handy switch that allows to change the table view to grid/blog view. Let the users choose what's best for them. The extension comes with a unique SEO functionality. In the settings area you can set your own names for the aliases, this gives you great option to customize the catalog to your needs (it does not need to be product, producer etc, you can change those parts). What’s more, you can choose what will be the Alias serparator (dash/coma) and ID position (before or after the alias). Add social buttons where you want. You can add any social icons/buttons! Use your favourite social buttons provide, or just use the generic buttons, it’s up to you, just insert the code. You can configure import tool by creating your own import dependencies. Users can ask question about single products as well as multiple products at once. Query basket allows users to add to the basket any amount of items and send question to Administrator about additional details he wants to get. Administrator can review queries in DJ-Catalog2 control panel as well as receive emails about the queries. It’s like having shop without option to pay for the products. DJ-Catalog2 comes with predefined countries from all over the world. Each user profile as well as product can be assigned to location and then searched on map. With the Map Search view you can allow users to search for items with selected radius from preferred location and see results on map.